The critically acclaimed title was unable to sell even half of what Namco Bandai had hoped it would. 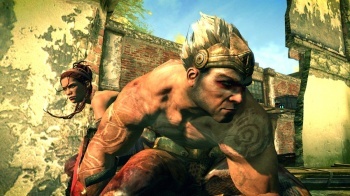 Reports that Enslaved: Journey to the West had sold around 800,000 copies would appear to have been nothing more than exaggerations, as the latest financial results for publisher Namco Bandai suggest that the game actually sold less than half a million copies. According to the figures, Enslaved sold just 460,000 copies, a total far lower than previous reports suggested. Namco Bandai's original sales target for the game was originally one million copies, making this a rather disappointing result for the publisher. Not disappointing enough, however, for Namco Bandai to consider Enslaved a lost cause. Only last week, PR manager Lee Kirton said that the publisher was proud of the reception that the game had received, and was considering the series' future. There's a lot of potential in the Enslaved story for a sequel, most obviously dealing with the aftermath of the first game's ending. If Namco Bandai use the strong narrative base the first game built as a jumping off point, and iron out some of the rough spots in the gameplay, there's no reason why a sequel can't succeed.